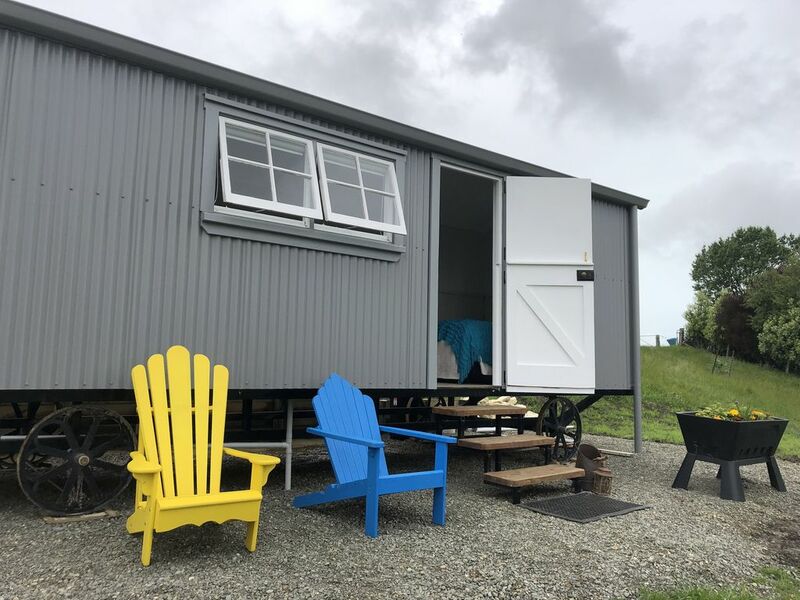 The Shepherd's Rest - a Shepherd's Hut situated on a farm close to Oamaru. The romance of a Shepherd's Hut. The Shepherd's Rest is located on a 200 acre working farm but only a 5 minute drive to central Oamaru. Our location is perfect for those who want to explore Oamaru and the Waitaki area but also want to escape to the country. It is ideal for 2 adults. The Shepherds Hut is a cosy structure on rustic metal wheels, 7m x 2.4m in size, think tiny house experience with a bit of glamping thrown in! Sleep well in the queen size bed with fairy lights above for a bit of magical effect. It has a kitchenette with a bar fridge, rice cooker, 2 ring cook top, electric jug and toaster as well as crockery and cutlery. At one end of the hut is a shower, vanity and composting toilet. Cape Cod chairs outside. Great for stargazing at night and views out to the Kakanui Ranges. Also a mini herb garden. There is NO WIFI - the idea is to unwind and escape technology for a bit. We do have a selection of games and books to keep you amused at night. Maximum of 2 adults and no children. Our family has have been hosting B&B guests for almost 6 years and The Shepherd's Rest is the latest addition to our farm, giving guests privacy and their own unique space. We rear and fatten bulls and run a small flock of sheep, a lifestyle we love. Apart from working we also enjoy gardening, hiking, cooking and carpentry. We love that while we live in a rural location the town of Oamaru is only a 5 minute drive away! We get country living with the convenience of town and all its amenities. The Shepherd's Rest is a little bit romantic, something a bit different from your average accommodation experience. The bathroom has a shower, vanity and composting toilet. We provide linen and towels. Looks out over neighbouring farmland. Note - due to electricity restrictions it's not possible to run the heater/cooktop/electric jug/toaster all at the same time. If you attempt to do this the power will trip out. Bed sheets, blankets. Spare blankets kept in plastic container behind the curtain in the bathroom. Access from the parking area to the hut is by a winding pathway that goes downhill. Bathtowels, hand towel, bathmat, face washers. Plates, bowls, mugs, glasses, cutlery, cutting board, pots/pans, french press, teapot. Kitchenette containing an electric jug, toaster, rice cooker, 2 ring cook top. The Shepherd's Hut is situated on a hill with a winding pathway. Access inside the hut is via 3 steps. The location and size of the hut is unsuitable for people with mobility issues. The Shepherd's Rest is located on a working farm - expect to hear noise from vehicles and animals. Details have been thought through in this tiny hut, and our stay was short and sweet. Totally recommend it for a lovely getaway with a countryside feel, but still really close to Oamaru's town centre. Thanks so much for your review. I’m so happy to hear you enjoyed your stay at The Shepherd’s Rest. The Shepherds Rest is situated on a hillside overlooking part of our farm and surrounding farms.